This guest post was submitted by: Samantha Peters. Add this to your bedtime battles and nighttime worries: more and more children are being diagnosed with childhood sleep apnea. This disorder occurs when the breath is interrupted during sleep. Although this obstructed breathing is not life-threatening, it does cause low-quality sleep and often leads to frequent wakefulness throughout the night. Because sleep apnea continually wakes up your child (even for a few seconds at a time, during which the child is not consciously aware that breathing has stalled), it keeps sleep within the first and second stage, before the restorative benefits of sleep develop. Sleep apnea prevents deep sleep and REM sleep, both of which are essential to rest, memory and learning. Even if your children seem to sleep for 10 hours every night, they are actually sleep-deprived. This lack of proper sleep leads to irritability, lack of focus, and inability to retain information. 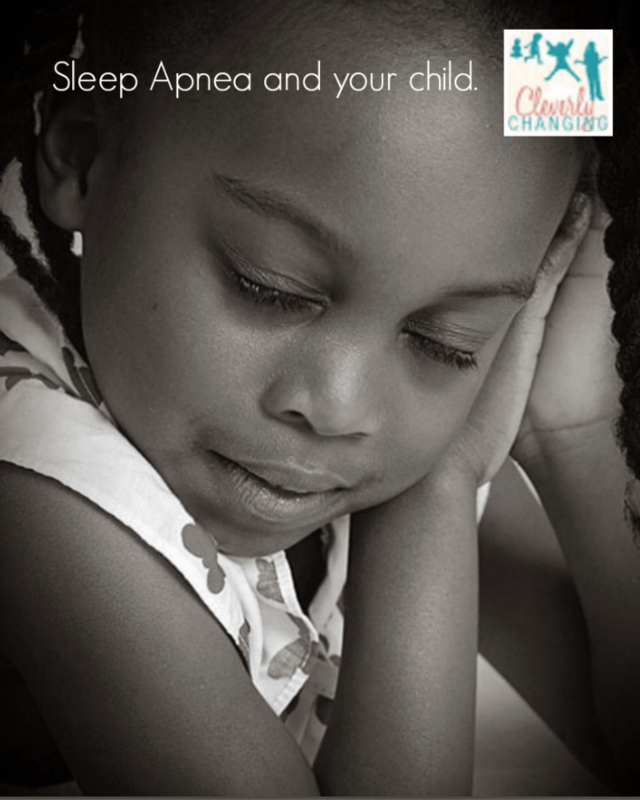 It’s thought that many children diagnosed with ADHD actually have sleep apnea. Taking your child to a dentist or sleep specialist for a sleep analysis is often just as beneficial as starting ADHD medication. What causes sleep apnea? At its root, sleep apnea is caused by an inability to take in air while sleeping. This obstructed airflow is sometimes related to obesity, but is more often related to an issue with the nose, jaw or throat. For example: children with swollen tonsils often develop sleep apnea, and their issues go away after the tonsils are removed. Children also develop sleep apnea if they have issues with their sinus passages, or if they have an underformed jaw. Dentists suggest that cases of sleep apnea in children are increasing in particular because children have fewer opportunities to build jaw strength by eating complex, challenging food. A few generations ago, children regularly bit into hard fruits like apples or hard vegetables like corn on the cob. Now, children eat puréed, fruit and vegetables in pouches, giving their jaws less opportunity to work their muscles. This is not meant to imply that a daily Go-Gurt or Peter Rabbit fruit purée causes sleep apnea. Instead, it’s a suggestion that parents include as many fresh, crunchy, complicated foods in their child’s diet as possible. Foods like applesauce, peanut butter and jelly sandwiches, and cooked vegetables are healthy but extremely easy to eat. Crunchier foods, like uncooked broccoli, sliced or whole apples and raw carrots all help jaw strength and stave off sleep apnea. How do you diagnose sleep apnea? Although you need a formal diagnosis from a dentist, pediatrician or sleep specialist, there are a few signs to watch out for. Every child snores occasionally, but regular, loud snoring is often a sign of obstructed airflow. The classic sleep apnea pattern goes like this: the child breathes peacefully, then breathing stops. After up to 30 seconds of stalled breath, the child suddenly snorts, gasps or snores loudly, and breathing resumes. This pattern repeats throughout the night, making it obvious why your child is not able to get proper sleep. If you notice these sleep apnea symptoms, it’s time to pay a visit to the dentist. What happens after your child is diagnosed with sleep apnea? There are a few options. John Calvert DDS, dentist in Austin, Texas, recommends a full consultation to analyze the severity of the sleep apnea and give proper treatment options. Treatments range from simple jaw-strengthening exercises, to a dental implant to change the shape of the teeth and jaw, to full dental surgery. Sometimes children simply outgrow sleep apnea, as they get older and their faces mature. In that case, a dentist sometimes prescribes a stopgap measure, such as a dental appliance to wear at night to keep the jaw from preventing airflow. In extreme cases, dentists recommend a CPAP machine to physically aid the breath; however, this is only used as a last resort. If your child has sleep apnea, don’t worry. It is easily treatable, and once your child’s airflow is restored, you will be astonished at how much better your child sleeps and how he or she starts improving both in school and at home. You wouldn’t want to be sleep deprived and grouchy every day; don’t make your child suffer, either. If your child appears to be suffering from sleep apnea, visit a dentist and talk about options.